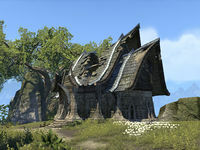 The Spinner's Cottage is a house in southern Greenshade, northeast of the Labyrinth. It is the home of Spinner Maruin, the gatekeeper of the Wilderking. He will teleport you to Silatar during the related quests. Spinner's Cottage Objective: Take part in Aranias' story. A copy of The Fall of Carac Dena can be found here.